Have you avoided orthodontic care because you couldn’t imagine yourself wearing traditional metal braces for a year or more? The good news is that bracket-and-wire braces aren’t the only option for image-conscious adults and teens who want a straighter, more confident smile. Invisalign is an FDA-approved cosmetic braces solution that’s virtually invisible because it uses a series of custom-made aligners instead of brackets and wires associated with braces. As you go through your treatment, you wear each custom set of aligners for about two weeks with each one progressively repositioning your teeth. This not only eliminates the embarrassment of wearing traditional braces, but it also leads to fewer office visits because there’s nothing to tighten or adjust. 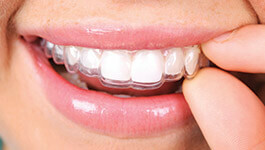 What’s more, you can easily remove aligners before eating, brushing, or flossing. This allows you to enjoy the same diet and follow the same kind of brushing and flossing regimen. Compare this to treatment with traditional braces. Certain foods damage the brackets and wires of traditional braces, and thorough brushing and flossing can be difficult. Your treatment with Invisalign starts with a comprehensive consultation during which we use 3D computer imaging to take digital impressions and design your treatment plan. Then, a lab creates your alignment trays according to our specific plan. As you go through treatment, you’ll only need to visit us every six weeks so we can check your progress. Within a few months or a year, you’ll achieve beautiful results that put a smile back on your face.